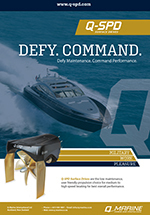 The New Generation QSD brings the lowest ever maintenance and most user friendly solution for medium and high speed propulsion. The QSD New Generation Series is suited to vessels typically from 8 meters with power options from 180hp to 3600hp, up to vessels over 100 tonne. This is a complete redesign of the original Q-SPD Systems incorporating the same successful construct as the original SD series plus many refinements in function, form and performance. 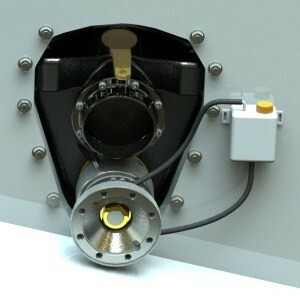 The result is a fully integrated propulsion solution designed for maximum longevity, that requires the least possible maintenance, and less often than any other. Exceptional performance and usability at all speeds, as is The Q-SPD Advantage with all Q-SPD systems, is of course a given. Manufactured using latest technologies in composites and marine friendly materials means they are very light weight and strong, giving a wide range of power for recreational and commercial applications. All vital mechanics and components are situated inboard away from the harmful elements. Bearings, bushes and seals for propeller shafts and steering mechanisms are long life, maintenance free and water lubricated, so no regular maintenance or additional lubrication of these external parts are needed. Except for the QSPD102 our integrated water cooled series with thrust bearings that are oil lubricated and water cooled. Exhaust is also accommodated for on all models used to ventilate the propellers for easier acceleration and transition. 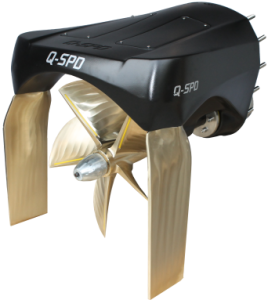 All QSD drives are supplied with intermediate shaft and Q-SPD specified custom designed propeller as standard thus completing the full propulsion solution. All Q-SPD follows a unique manufacturing process that assures absolute perfection in all aspects of the build and thus the assurance of the top quality and workmanship. Only top quality marine friendly products are used in all components. No compromises are accepted. This philosophy is how we assure that the maximum reliability and longevity is achieved, no matter what the application. In short we are in the business of making lasting products, not products that will need ongoing and continue maintenance that incur unnecessary and excessive cost to the owner.